Privacy filter keeps confidential information private. Only persons directly in front of the monitor can see the image on screen while others on either side of it see a darkened screen. It is great for high traffic areas and open office environments. 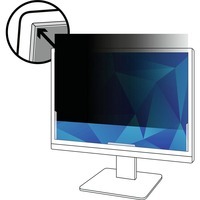 Filter is designed to fit wide screen desktop LCD monitors with a diagonally measured 27 116 viewing screen and a 1610 aspect ratio. Actual filter dimensions are 22 1516 wide x 14 516 high 582mm x 364mm. Filter includes your choice of two easy attachment methods. Reversible, matte side reduces glare and reflections. Lightweight, thin, frameless design protects display from dirt, debris and scratches. Clean easily with a soft cloth and water.